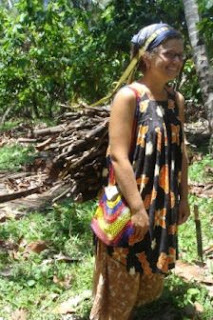 Cris taught us about collecting firewood: how to cut it with a bush knife, tie the sticks together with rope made from tree bark, and carry the bundle on our head. 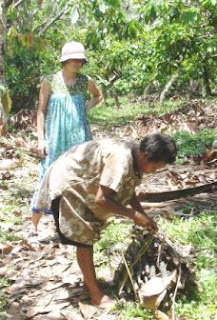 Note the bush knife on my right in the bottom picture—it is a knife generally about 1½ ft--used for anything from chopping wood and opening coconuts to cutting the grass. I've been reading your blog while you've been at POC, because I'll be coming to POC next August! I had a question about the meriblouses you are wearing in the pictures in this post... did you get them (or have them made) in PNG or did you get them somewhere in the States? I'm just trying to get ready, so any info I can get is helpful... thanks! I'm looking forward to continuing to read about your adventures in PNG! About the meri blouses, yes, I got them here. They are sold in the market in Madang (the city close to POC) for $5-10 U.S. At POC they will take you all into town a few times, so you should be able to pick some up then if you choose. Not very many gals our age wore meri blouses in my village. They mostly just wore shirts and baggy shorts (like board shorts) that covered their knees. I would definitely try to bring a couple pairs of long board shorts (like guys shorts, that will be long enough to cover your knees) and a couple of t-shirts. Then when you get here, you can decide if you would like to supplement with a few meri blouses (I think I wound up with about 3). I'm glad to answer any other questions you may have ~ see you next year! !